Nothing says western big game hunting like a Rocky Mountain elk hunt and nothing could be more rewarding than savoring the pungent odor of elk in the Idaho high country…in my opinion of course. Elk hunting is my passion and sharing the woods with like-minded hunters is why I and other outfitters like me do what we do. Big paychecks and luxurious vacations are nice (or so I am told), but a bugling bull elk on a crisp autumn morning, now that is a treasure to behold. Nothing says fall has arrived quite so eloquently as an Idaho elk bugle splitting the morning air. Chasing bull elk in the rugged Idaho backcountry requires stamina and patience mixed with a little grit. Idaho’s backcountry is rugged and steep. The elk on their 4 legs have a bit of an advantage on us 2 legged flat landers, but that won’t stop us from trying to outwit a lovesick bull elk during the rut, enticing him with the sounds of a love struck cow elk hoping he “bites” and comes in for a look. If you have ever experienced a close encounter with a bugling bull elk and weren’t forever changed, than I guess golf is your game and you aren’t reading this for you. If however, you were moved to the depth of your soul and hooked, hook, line and sinker for more…more elk, more mountains and more autumn mornings in the Idaho high country! Then an Idaho elk hunt might just be what the doctor ordered. We are fortunate in Idaho’s backcountry units to be able to offer rifle elk hunts in the rut as well as a lengthy season overall. Also, because of the remoteness of these elk hunts you are able to combine other tags for other species and enjoy an real Idaho "combo hunt" including elk, deer, bear and now wolf. Our early season Idaho rifle elk hunts take place from our drive in “upper” camp where we utilize a Wilderness Road corridor to access points farther out and to cover more ground than one might cover on foot or horseback alone. We drive out to one of our “honey hole” drop off spots and then hike in for the day. We may need to pack a lunch because this country is big and seems even bigger once you leave the truck. 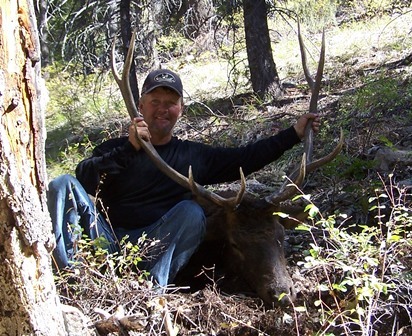 If a more traditional pack in Idaho elk hunt is what you want, you might consider some of our later season hunts. We still have good opportunity for an Idaho elk and the closer to November we get the better the chance at a rutting deer if you chose our combo hunt. Our pack in camps we use after the early season as we need to get safely out of the high country before the snow locks us in until spring and they have all the key ingredients for a “real western elk hunt” in the form of horses, mules and wall tents. 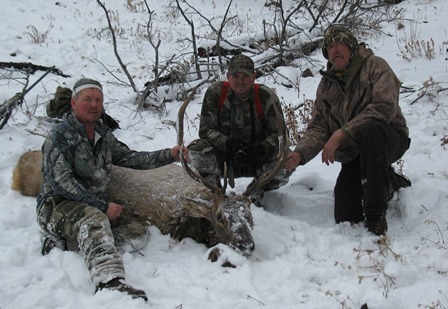 Contact us today and let’s get you lined out on your backcountry Idaho elk hunt. Bring your friends and kids.